One of Cornwall's most famous landmarks is to be given to charity after its reclusive owner died on Tuesday. Babs Atkins bought Looe Island, a 22-acre outcrop one mile off the south Cornish coast, with her sister Evelyn in 1965. 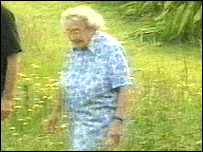 Miss Atkins, who was in her 80s, said she would leave it to Cornwall Wildlife Trust after Evelyn Atkins died in 1997. Callum Deveney from the Trust said Miss Atkins was determined the island would become a nature reserve. He said: "It's very sad news for us, it's the end of an era with her sister and her having been involved for so long. "We've actually been involved with Babs for the last four or five years. "We've had a lease on island and so our plans have been developed while Babs was alive and she's approved those plans." The sisters bought the island, which is a breeding ground for blacked-backed gulls, for £22,000. Miss Atkins, who died in her sleep, was the island's sole resident and will be buried there. The island, which is also known as St George's Island, is normally only accessible by boat but on just one or two days a year there is usually a tide low enough for the journey to be made by foot across the rocky sea floor. Legend has it that Joseph of Arimethea landed there with the Christ-child. "Babs Atkins fell in love with Looe Island back in the 60s.."